TINGGUIANS OF NAMARABAR. Tourism itineraries to Abra did not include a trip to its tribal community so I requested our freelance tour guide to veer away from the usual route and take us to the Tingguian village of Namarabar in Peñarrubia. 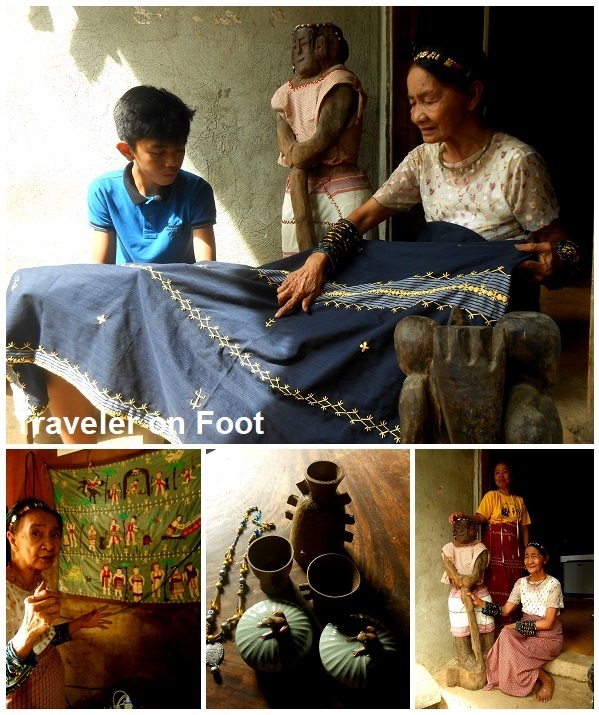 The Tingguian culture dates back to pre-Spanish times but despite of strong external forces encroaching their traditions, they continue to practice their ethnic beliefs and handicrafts. The Tingguians are also called Itneg, a contraction of the Ilocano words iti uneg, which means interior that refers to the location of their settlement at the heartland of Abra. The Tinggians originally settled near the lowlands of Narvacan and Santa in Ilocos Sur and had constant contact with the Ilocanos but because of the clashes between the natives and Spaniards, they moved out from the war-torn valley into the uplands of the Cordillera. HIGHLAND HERITAGE. The road to the uplands of Abra bends towards the foothills over alternating paved and dirt tracks with a panorama of undulating rice fields and mountain ranges under low overcast sky. Upon ascending on a clearing, we arrived in the village of Namarabar. The villagers were curious of our presence until tribal elder Norma Mina Agaid came out to see us. 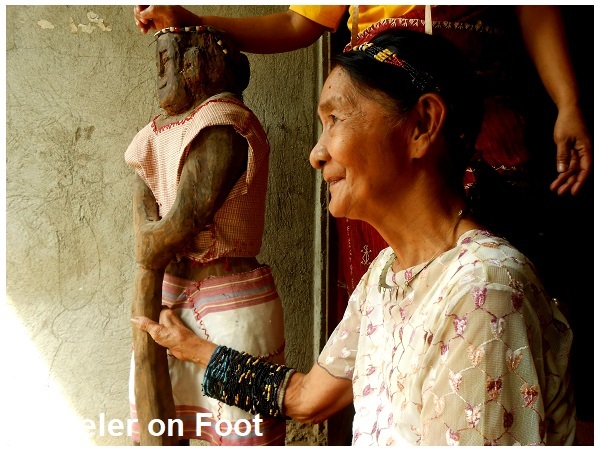 Graceful in her sleeves of heirloom beads, a symbol of prestige equivalent to the tattoos worn by their mountain cousins in Kalinga, life in the village and Tingguian weaving traditions echoes in Nana Norma’s lively storytelling. NORMA MINA AGAID. We were invited to Nana Norma’s home. We were offered some refreshments. Later, the women folk came in a line through the door behind the house. Each carried piles of woven fabric that they showcased on a long table. Proud of their handiwork, they spread out each fabric to reveal the intricate interlacing threads and figures that form in the weaving patterns. Nana Norma belongs to a generation of weavers. She learned to dye the threads and to weave distinct patterns into the fabric from her mother as early as eleven years old. 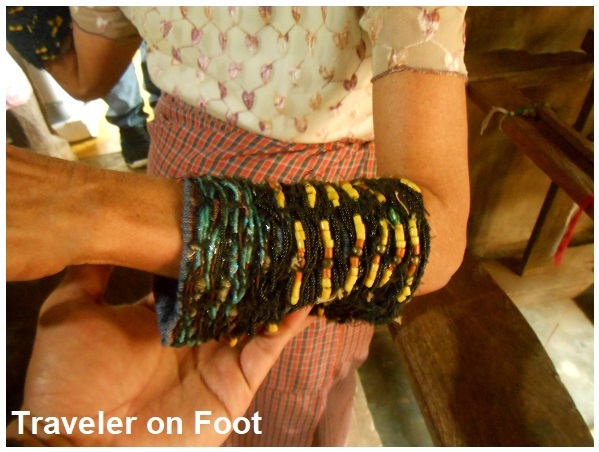 Her children learned weaving techniques from her. 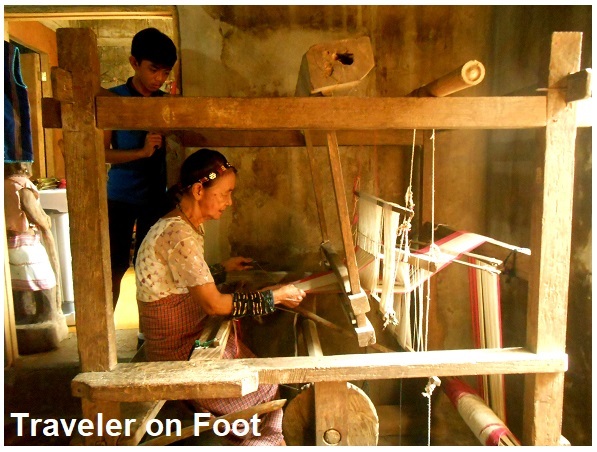 Life of the womenfolk in Namarabar is oriented towards weaving. They start their day weaving and taking short breaks to have coffee, meals and when it’s time to feed the livestock. 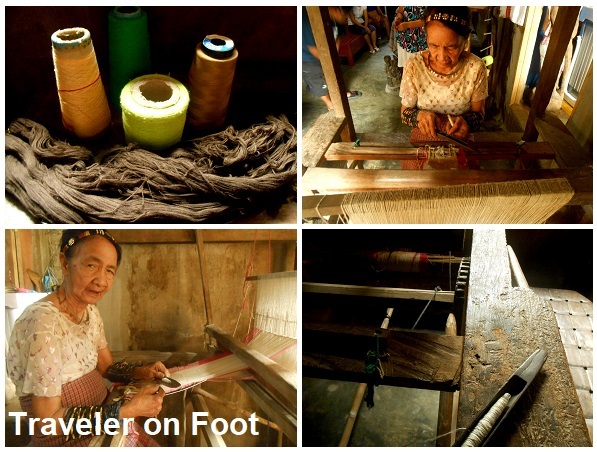 TINGGUIAN WEAVING TRADITIONS. Tingguian weavers practice a ritual before weaving. It involves sacrificing a native pig, dancing and praying to Pinaing, the goddess of weaving who according to Tingguian folklore, introduced to the Tingguian women the weaving patterns for the pinilian and binakol and the embroidery style called kinamay through dreams. 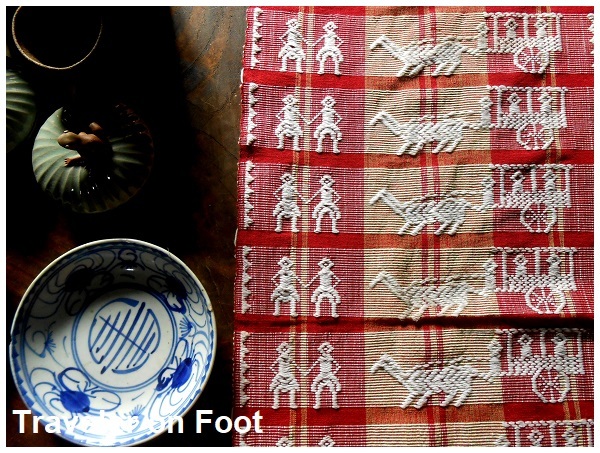 Pinilian refers to a grid style weaving pattern with motif that form the shape of a deer, an eagle, a lizard, a flower, an eight pointed star, sinang-kabayo (horse), sinan-tao (human figure) and other complex Pinilian motif. 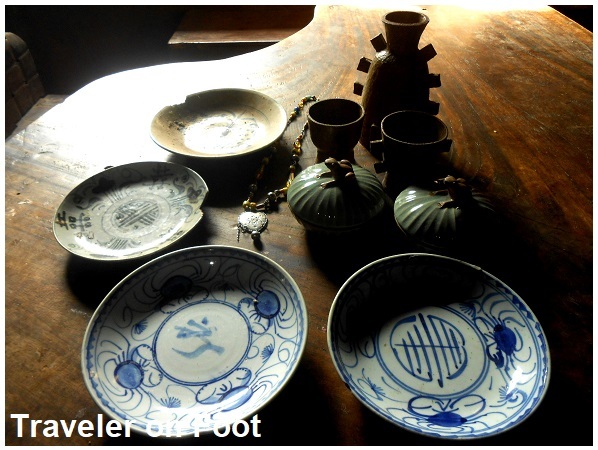 These symbols have meanings that were exclusive to the Tingguians. These motifs are believed to provide protection from evil spirits and are symbols of prestige among the tribe. Pinilian fabric is used as a wrap-around skirt, loincloth for men, and headband and belt. 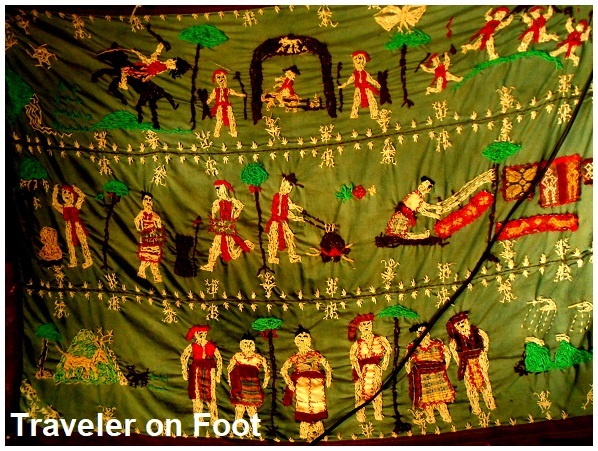 Pinilian blankets are also used in important rituals. The Ilocanos learned the pinilian technique from the Tingguians. 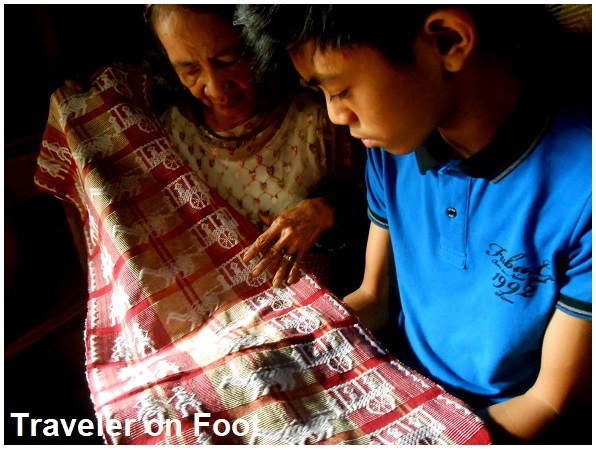 The weaving patterns used for Abra abel and the psychedelic optical art weave of the binakol today for instance are based from the traditional pinilian patterns. AM-AMMA. In 1959, Norma wanted to paint but she can’t so she embroidered on abel fabric using the kinamay embroidery the Am-Amma that visualizes the story of their ancestor gods and folk myths. On a spread shows the all-weather Tingguian warriors guarding the Tangadan Tunnel against the invading Ilocanos while the Abrense heroine, Gabriela Silang ride the horse. 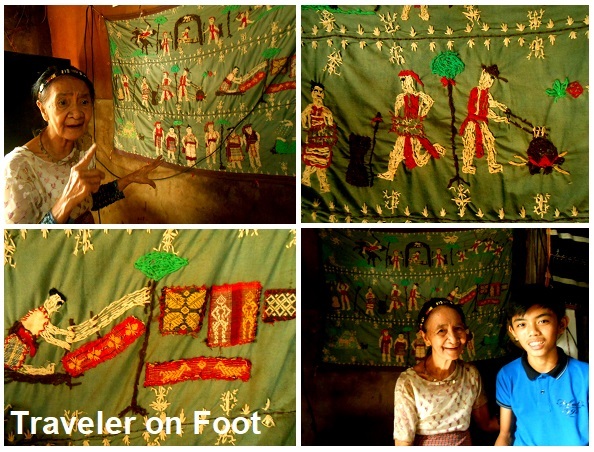 The center row illustrates the the ancient method of dyeing cloth using barks and plants and the goddess weaver, Pinaing who introduced through dreams the weaving patterns to the Tingguian women. EPILOGUE: MANLILIKA NG BAYAN. Abra had its first Manilikha ng Bayan in Apo Teofilo Garcia, the tabungaw hat maker from San Quintin. Maybe this valley of folk artists can have another one. This time a weaver and storyteller from Namarabar. MEMENTO TO FIRE FIGHTING. The Philippines has two alternating seasons, wet and dry. The stormy and wet season begins in June and last until October. Dry season starts in November and ends in May. The months of March and April are the hottest. These months are ruled by the fire element, Aries. It is believed that accidents involving fire are most tragic in this time of the year such as the Ozone Disco fire that claimed 162 lives in March of 1996. Ironically, fire prevention awareness is observed nationwide in March because, based on statistical data this month is when most fire incidents occur. With wailing sirens, firetrucks from different fire stations around the city parade the streets to announce the Fire Prevention Month. 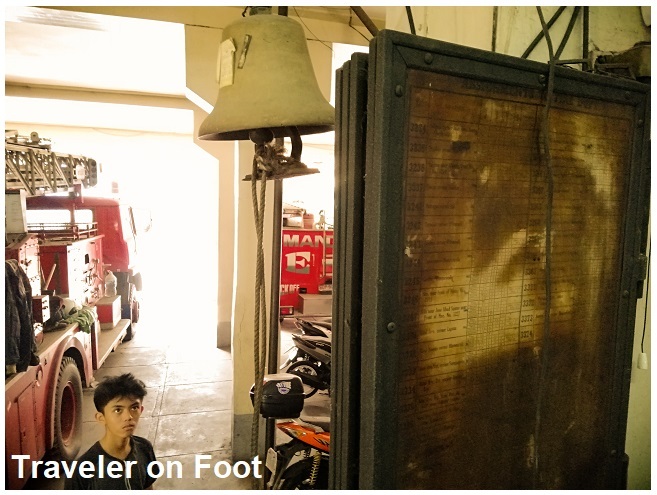 At the San Lazaro fire station, an antiquated steam powered fire truck is displayed as a memento to the beginnings of fire fighting in the country. 18th CENTURY FIRE CHASERS. During the Spanish times, a fire that broke out anywhere in Manila was announced throughout the city through a special tolling of the church bells. For example, a fire in Quiapo is announced through seven strokes, ten when fire was in Tondo, five strokes in Binondo and so forth. There were no regular firemen then. Fire-fighting was done through volunteerism or bayanihan where the men folk were expected to rush to the scene and help put out the fire. A strange tradition then was the required presence of the Spanish Governor-General or the Archbishop of Manila at fire events. The first fire chasers in those days followed were not from screaming firetrucks, but the fast carruajes of the señor governador-general and the señor arzobispo who were racing each other to the blaze. With all those present, big fires in the olden days must have been colorful and even festive for the side walk audience. YANGCO FIREFIGHTERS. 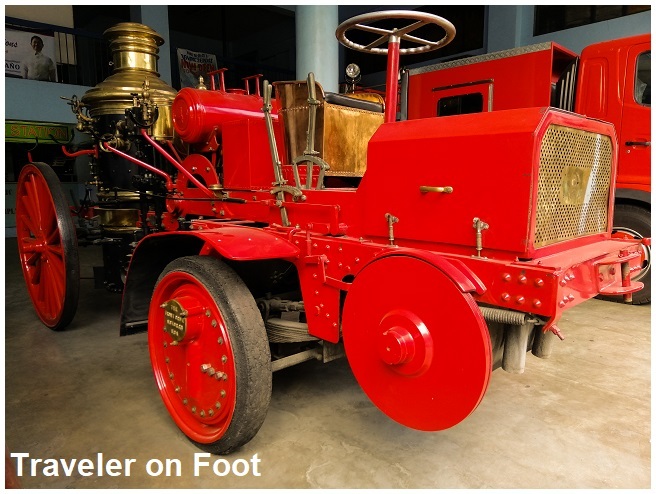 In the 1890’s, Captain Luis Yangco of the famous shipping company introduced the first motorized fire engine that outdated the only fire wagon in Manila. Yangco’s firefighters were composed of dock laborers that raced through the streets whenever a fire broke out in the city. 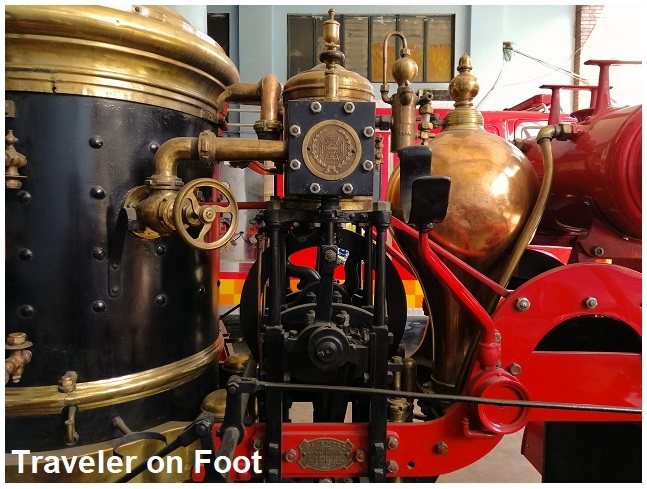 The modern fire engine was equipped with a large hose that draw water from the nearest river or canal. At about the same time, British merchants in Manila, organized themselves into a fire brigade with headquarter on Calle Anloague (the same street mentioned in Rizal’s Noli me Tangere). The brigade has a steam engine of its own and responded to fire events in the business areas of Sta. Cruz and Binondo. This fire brigade was the first to donned white helmets and bright red coats as fire-fighting uniform. FIRST FIRE CHIEF. The Americans established a professional fire-fighting force with Hugh Bonner, the former Chief of New York City Fire Department as its first fire chief. During the American Era, the Manila Fire Department (MFD)started with 80 men and four fire stations in Tanduay, Sta. Cruz, Paco and Intramuros. It introduced a modern fire-fighting system in the country that included the sliding pole and the raincoat uniform. It had a hook-and-ladder company and four engine companies who were professionally trained at pumping water and rescuing those who were trapped in the blazing structure. During this time, church bells no longer served as fire alarms. In July 1902, the 80 Gamewell Fire Alarm System boxes were installed around the city and fire alarms were received by firemen through the telephone system. EPILOGUE: FIRE FIGHTING MUSEUM. 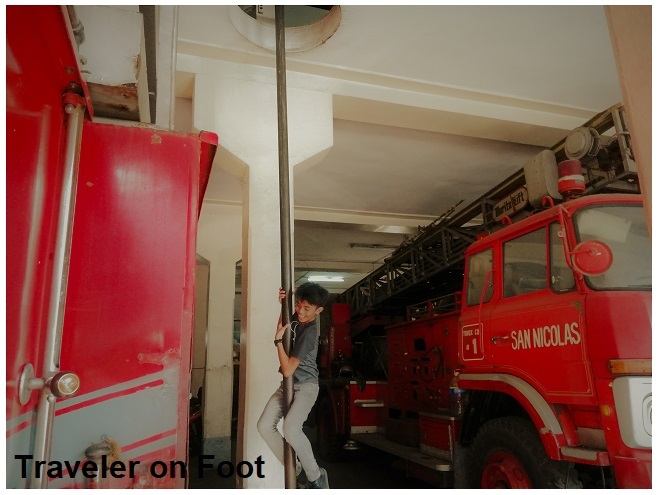 The fire station in San Nicolas became famous in the olden days because it had one of the finest gymnasiums in town. According to Nick Joaquin, sportsmen labeled it as the Cradle of Boxing in Manila where ‘American firemen would gather the neighboring kids in their makeshift boxing ring, provide them with boxing gloves, and make them slug it out for a purse collected from all the station’s firemen.’ These prizefights developed a local taste for boxing among Filipinos, which marked the glory days of the pre-war 1920s. 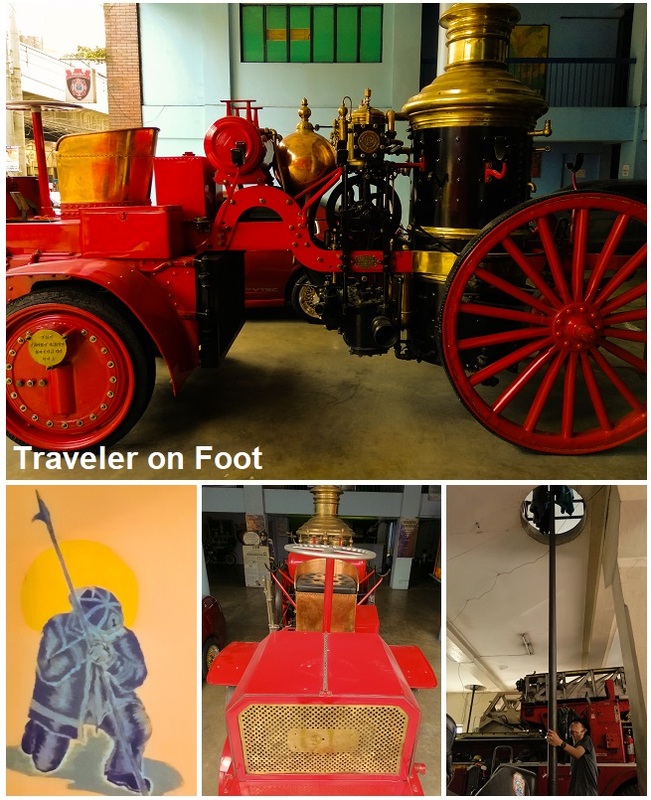 Stories about the beginnings of fire fighting in the country and how fire station became part of local communities are part of our heritage that must we retold in museums along with the first fire fighting equipment. From the time Prometheus lit a torch from the sun and brought fire down on earth as his gift to humankind, men had also learned how to control its dangerous flames. Courageous fire fighters through centuries had a heroic role in keeping our towns and cities safe. We hope local governments put up museums dedicated to fire fighting history. STEPHEN’S SAN NICOLAS. There is a surge of nostalgia among the millennial generation to an Old Manila that we only see in books and in digital media. Museum guides, aptly called docents and heritage preservation groups are now being championed by energetic, civic-minded individuals from this internet generation. Stephen John Pamorada grew up in the historic San Nicolas District. 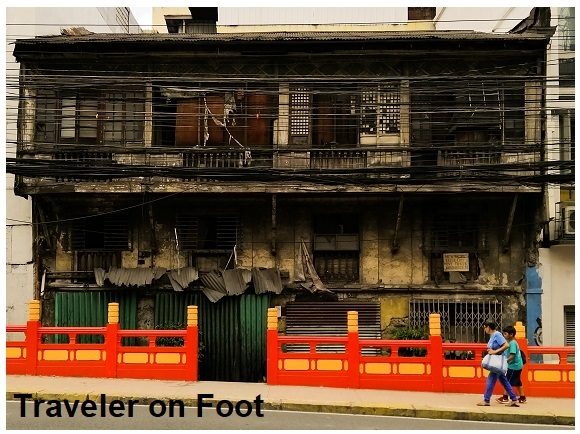 In this bustling residential area, located at one of the world’s oldest Chinatowns near the piers and people’s markets of Divisoria are some of the remaining ancestral houses in Manila dating to the Spanish period. 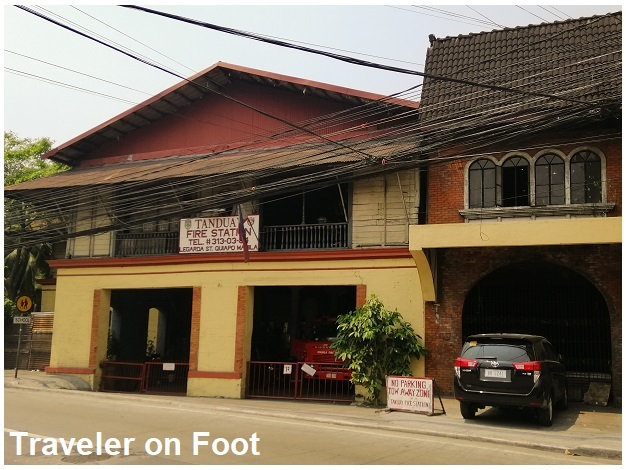 These houses, still standing with their original hardwood frames, wrought iron grillworks and roof tiles like the Bahay na Tisa in a corner lot along Elcano and Lavazares streets, are just a few years away from being demolished or moved piece-by-piece to an antique auction or that heritage resort unless solid efforts are made to prevent it from happening. BINONDO. 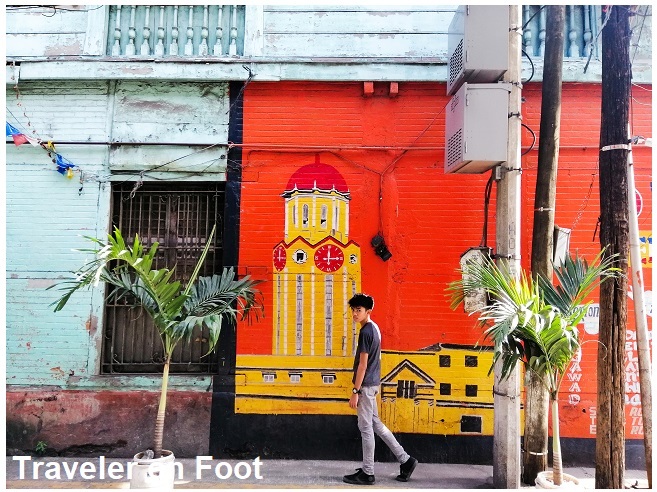 One afternoon, Stephen showed us around San Nicolas District where a turn at every street corner was like turning a page of a mystery game book to reveal either a historical marker to an erstwhile structure or a decrepit ancestral house that is best described in the past tense. Binondo was founded on Minondoc, an island across the Pasig River from Intramuros. It was a land-grant given by the Spanish Governor General Luis Perez Dasmariñas to the Chinese migrants who converted to Christianity and intermarried with the locals. Through most of the 19th century, Binondo became the commercial capital of the country. It boasted of a stone church that overlooks Plaza Calderon de la Barca, made charming by its twin fountains. Around this impressive plaza stood landmark buildings, the Hotel de Oriente and La Insular cigar factory. Both were architectural masterpieces in neo-Mudejar style by Spanish architect Juan Jose Huervas y Arizmendi. LEGEND OF BUAYANG BATO. By the 16th century, Binondo’s population began to swell and it became necessary to expand the settlement in Minondoc to the adjoining village of Baybay. The union of the two villages on March 28, 1594 became the foundation day of the Arrabal de Binondo. 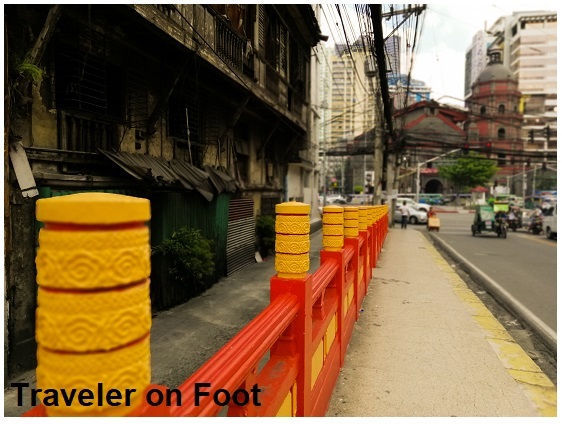 Just like in Intramuros, streets in this suburb were arranged in gridlocks and were marked by street signs made of glazed tiles embedded on corner houses. As its residents grew its wealth through trading and retail business, they were able to build fashionable houses as high as three-floors. An excellent specimen would have been Casa Vyzantina at the corner of Madrid and Peñarubia streets but this opulent three story house, also designed by Arizmendi was transferred to a resort in Bataan. The village of Baybay was later renamed after the Augustinian saint, San Nicolas de Tolentino who was famous for the miraculous appearance of migratory birds locally known as the tarat during his feast day, the curative sacramental bread called the Panacillo de San Nicolas, and the legend of the Buayang Bato. In Jose Rizal’s novel, El Filibusterismo the character Padre Salvi narrated the story of the Chinese fisherman who was attacked by a crocodile that once plagued the Pasig River. He cried out in an identifiable accent San Nicolasi that instantly turned the the voracious reptile into stone. PANCETERIA MACANISTA DE BUEN GUSTO. Also mentioned in El Filibusterismo was Panceteria Macanista de Buen Gusto. 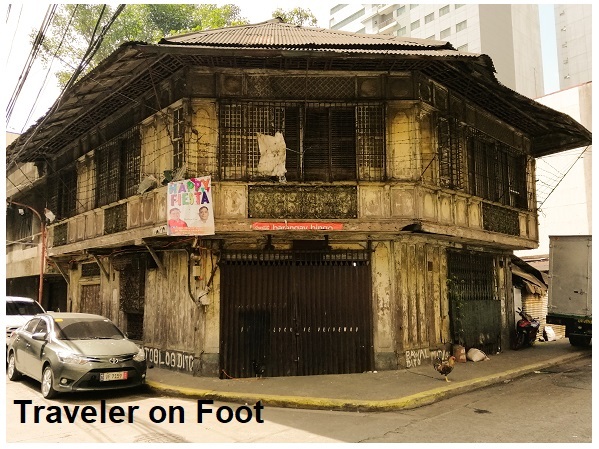 A crumbling structure that once housed this famous restaurant is sandwiched between modern concrete buildings along Blanco Bridge that connects Binondo to San Nicolas District. 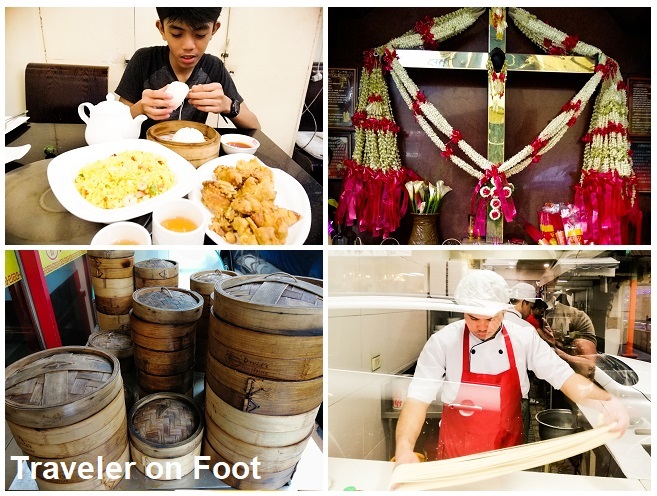 The food served in the panceteria that were described in Chapter 23 of Rizal’s second novel were the lumpia (spring rolls), torta (crab omelet), pancit guisado (sauteed noodles), and the pancit lang-lang, which was a mix of mushrooms, lobster meat or shrimps, egg noodles and chicken bits in a broth. Dining furniture was made up of round tables with equally round little wooden stool that served as seats. At the center of each table were four small colored plates with four pastries on each one and four tea cups in red porcelain with corresponding lids. Also on the table were a bottle of wine and two wineglasses of gleaming crystals. On the wall was a signage that read: De esta fonda el cabecilla al publico advierte. Que nada dejen absolutamente sobre algune mesa or silla. We stared for a moment at the abandoned wooden structure and thought that nothing much has changed since Rizal wrote the novel since to this day we see an equivalent of that reminder posted in fast foods and public places as Management will not accept responsibility for the loss of personal belongings left unattended (on tables or chairs). Thieves still thrive in these modern times. SANTO CRISTO DE LONGOS. 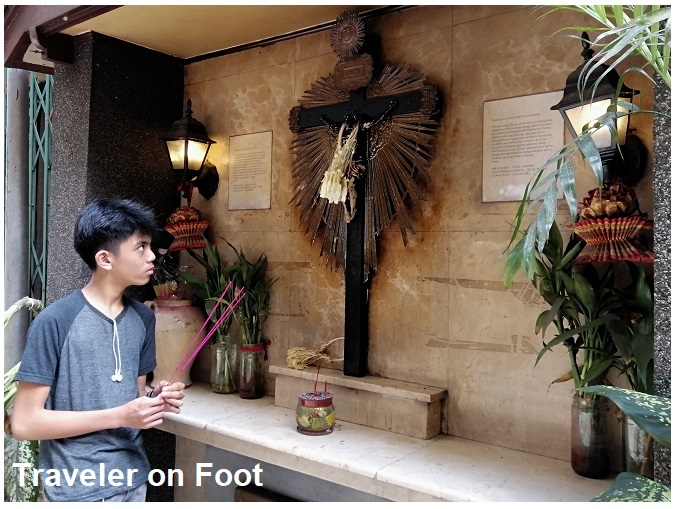 Another popular legend in Binondo relates to the finding of the image of Santo Cristo de Longos. The story goes that some time in the 16th century, an inarticulate Chinese laborer was drawing water from a well in the barrios of Longos. When he pulled out the pail, he found a blackened corpus of the crucified Christ without a Cross. He began shouting to announce about his discovery. The news about a deaf-mute who miraculously gained speech spread and the image became a popular object of devotion among residents of the settlement. 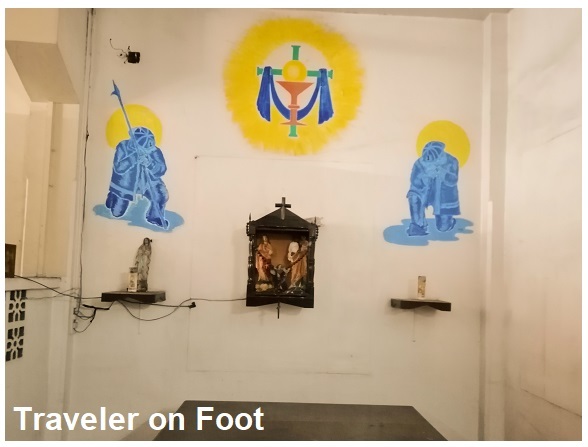 The image was immediately fitted with a cross and was enshrined in the Capilla de San Gabriel while a street side shrine on the sight of the well was built with a replica of the Santo Cristo de Longos. 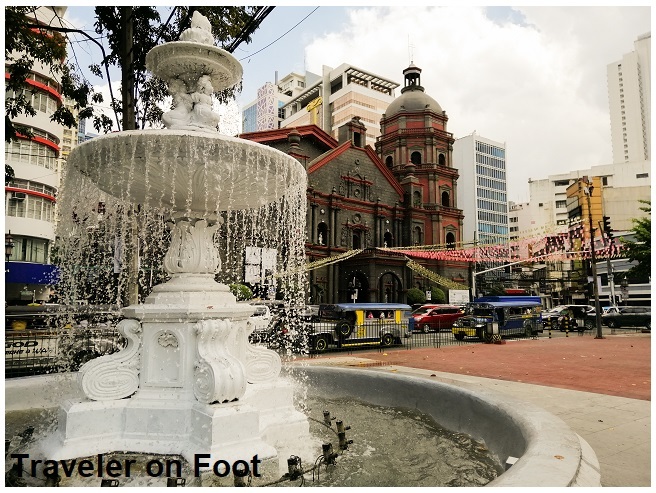 When an earthquake destroyed the chapel, the original image was transferred to Binondo Church. In 1704, The Venerable Hermandad del Santo Cristo de Longos was founded to propagate the devotion to the miraculous image. CASA TRIBUNAL DE NATURALES. 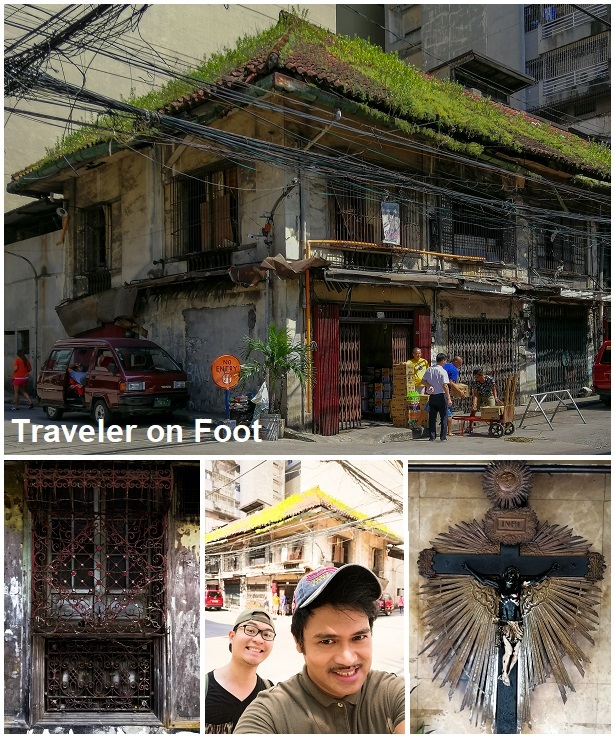 For the next three hours, our walking tour with Stephen covered streets in San Nicolas where most of the remaining ancestral houses were clustered in the area. These ancestral structures, though neglected for years and deteriorating give us clues on their function and how the community developed around them. A lonely structure from two centuries ago, in a street of high-rise buildings along Calle Asuncion was the Casa Tribunal de Naturales. 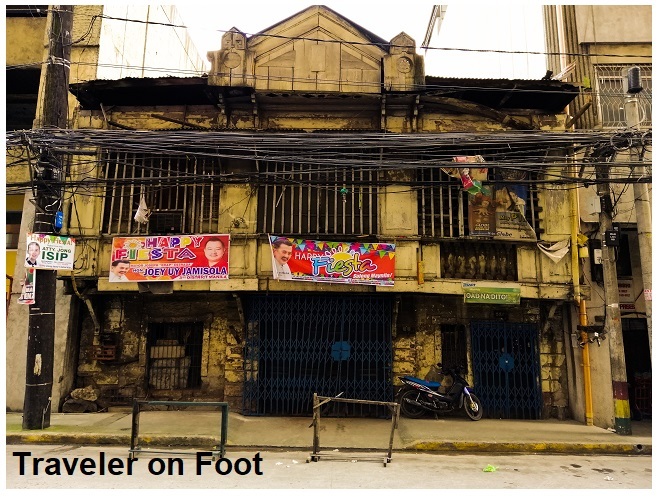 This used to be the courthouse that caters to the Chinese and meztisaje residents of old Binondo and San Nicolas. Officials presided over cases that was led by a Chinese gobernadorcillo, equivalent of today’s town mayor. 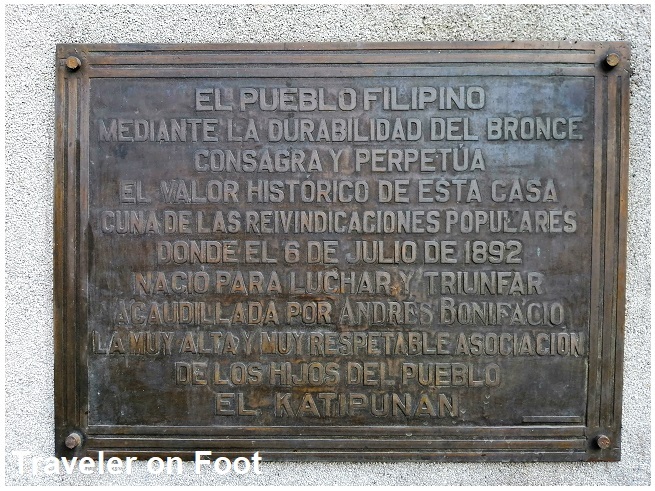 A well-known gobernadorcillo of San Nicolas was the 19th century metal smith and bell caster, Hilario Sunico. ESTILO SUNICO. I immediately recognized the ancestral house at the corner of Madrid and Lara streets that I first saw from the pages of the iconic Philippine Ancestral Houses by GCF Books. I learned from Stephen that it once belonged to the sought after metal smith and bell maker, Hilario Chanuangco Sunico y Santos. The house was built 1890. It was home to his wife Sergia Litonjua y Pablo, and their four children Dionisia, Tomas, Sebastian and Rosalia. The house was relatively in a sound condition. 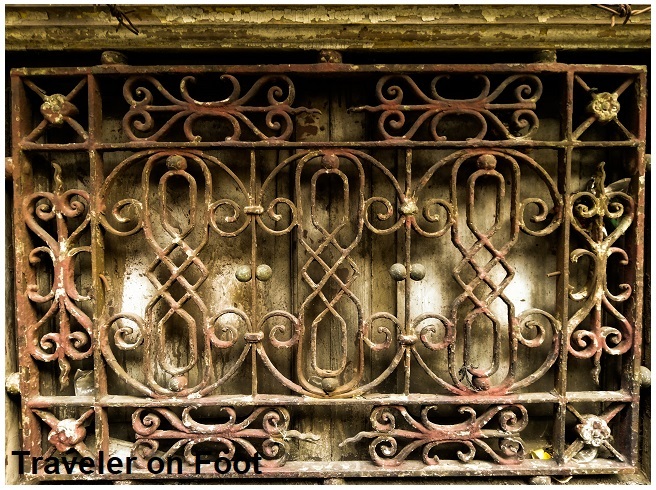 Intact were the ornate grillwork on the windows and ventanillas that Hilario must have also applied his style in crafting the metal works for Puente de Colgante in Quiapo, Tutuban Train Station in Tundo, the wrought iron fence of the Jesuit Church in Intramuros and the electric chandeliers designed by Isabelo Tampingco for San Sebastian Church in Plaza del Carmen. FUNDICION DE HILARIO SUNICO. A block from the Sunico residence was the historic metal foundry where Hilario Sunico cast some 176 brass bells for the different churches around the country. Hilario sharpened his skills in metal crafting at an early age at his father’s foundry. He started making small bells and metal fittings for calesas as source of income to support his family. Later, he put up his own foundry and made brass bells that bear the name Fundicion de Hilario Sunico. His earliest works was dated 1872. 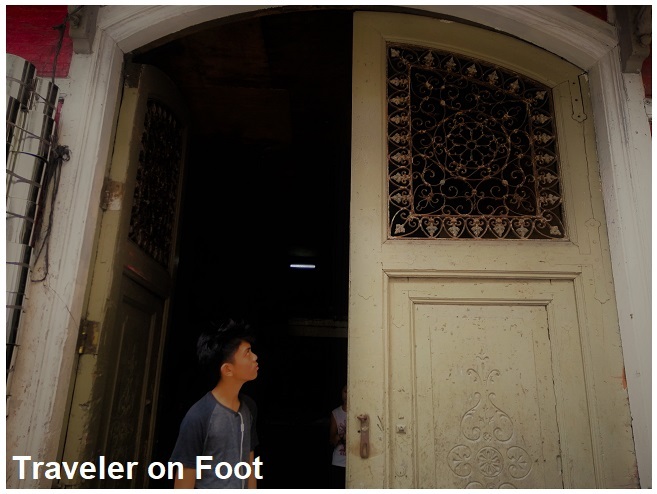 He crafted the bells of Binondo Church in 1878. From 1872 to 1937, the Sunico trademark were inscribed in most church bells around the country. Church bells from the Sunico foundry gained a good reputation for their rich tenor. The secret was in the right mixing of metal alloys like bronze, copper and stannite. Upon Hilario’s death, the secret formula and bell casting business was passed on to his only son, Tomas as Herederos de Hilario Sunico. The demand for church bells diminished during the American period. The foundry eventually closed down leaving behind a heritage structure that still bears the ornate Estilo Sunico in its doors and windows. 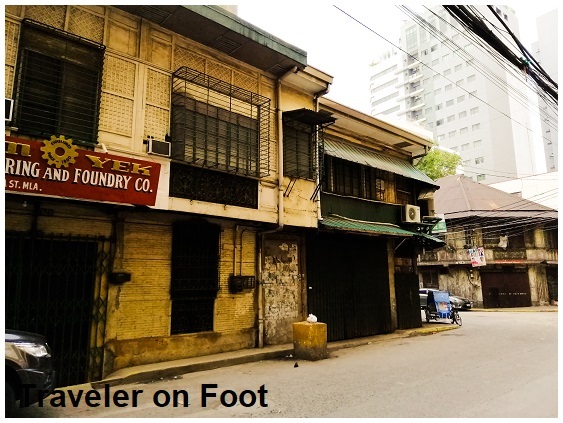 The Sunico residence and the foundry deserve a historical marker. But what can a piece commemorative plaque do to prevent heritage structures from vanishing? X MARKS THE SPOT. Like a treasure hunter, it excites me to locate historical markers because it means that there must be something or someone, an important event that made a space historically sacred worth a pilgrimage. Along Estraude Street was the house which the Rizal family rented where the bone remains of Jose Rizal was placed in a wooden urn after it was exhumed from Paco Cemetery. The house was razed by fire. A modern building stands on the site. Two historical markers attached to a skyscraper in Calle San Fernando marks the site of a house where Doña Teodora Alonzo, the mother of Rizal spent her last days. A historical marker along Calle Lavezares marks the site of the house of Dr. Pio Valenzuela, a member of the Supreme Council of the Katipunan where he once offered free medical services for the poor and housed the secret printing office of the revolutionary paper Ang Kalayaan. 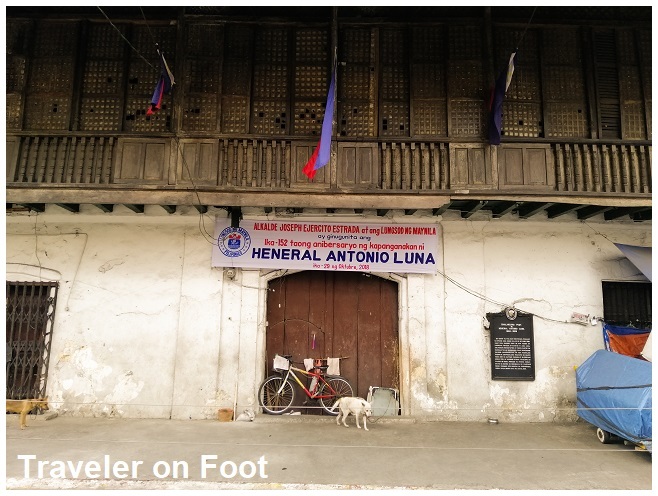 Still standing along Calle Urbiztondo was the bahay-na-bato where General Antonio Luna was born in 1866. It is currently used as a warehouse. The grounds of Perdo Guevarra Elementary School was the site of the 18th century silk market. The Alcaicería de San Fernando, which literally means the King’s market was an octagonal structure for trading goods. A stone marker was unearthed from this site. It is safely kept in the National Museum. A cast of the marker’s replica is displayed in the campus. 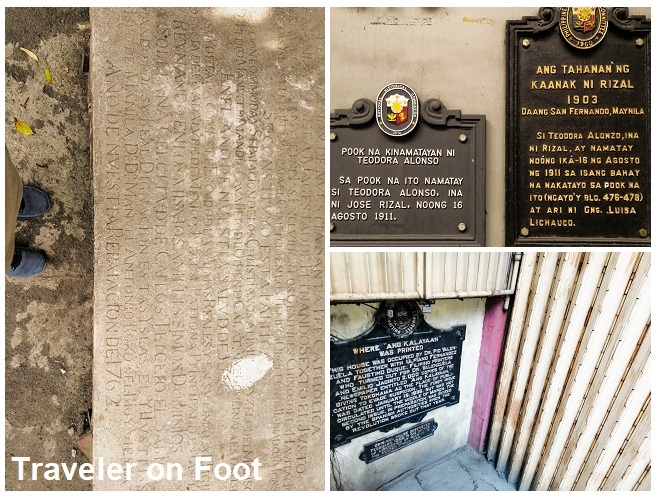 Locating these historical markers in San Nicolas District was like discovering the X that marks the spot to that sacred ground only to realize that they have been desecrated and looted of their heritage treasures. SAN NICOLAS FIRESTATION. Next to Perdo Guevarra Elementary School was the San Nicolas Fire Station. 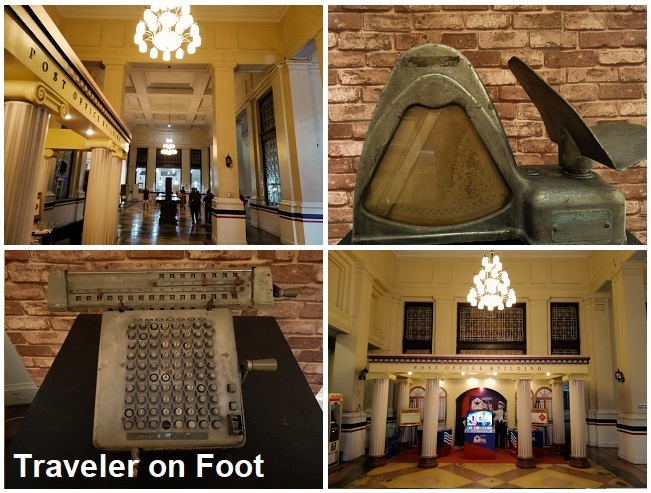 It was among the oldest in the Manila dating back to the time of the first American fire chief Hugh Bonner. The Americans replaced the fire wagons with steam-powered water trucks and introduced a modern fire fighting system in Manila that included the sliding pole and the raincoat uniform. 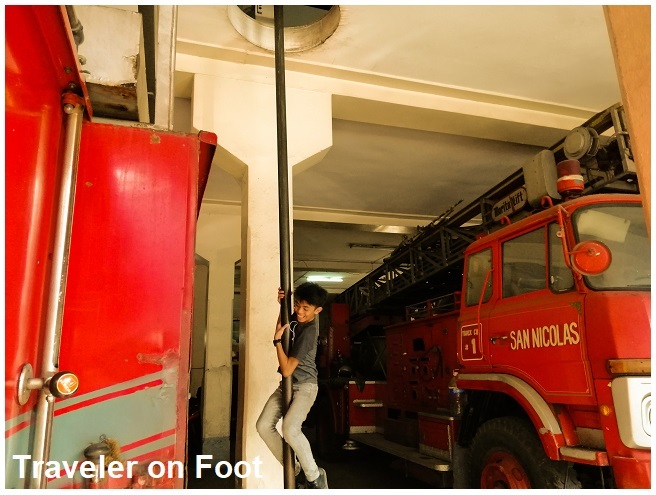 The fire station in San Nicolas became famous in the olden days because it had one of the finest gymnasiums in town. 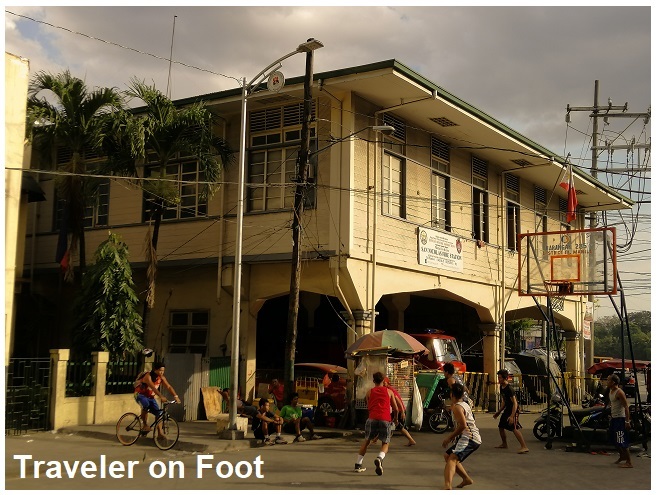 According to Nick Joaquin, sportsmen labeled it as the Cradle of Boxing in Manila where ‘American firemen would gather the neighboring kids in their makeshift boxing ring, provide them with boxing gloves, and make them slug it out for a purse collected from all the station’s firemen.’ These prizefights developed a local taste for boxing among Filipinos, which marked the glory days of the pre-war 1920s. FOUNDING OF THE KATIPUNAN. 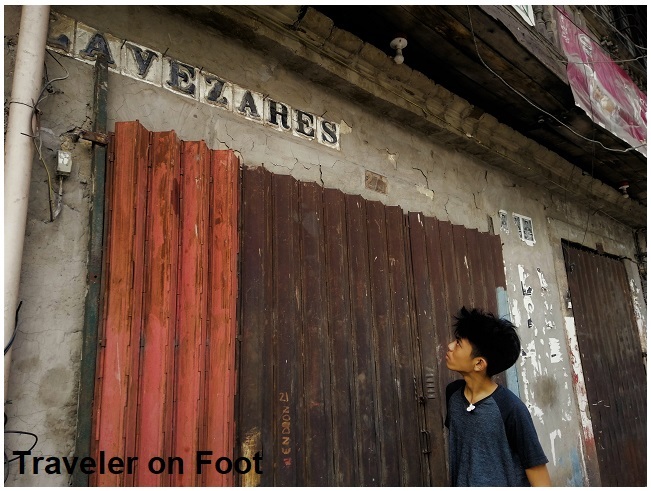 We walked towards Divisoria to locate No.72 Azcarraga corner of El Cano. Azcarraga was renamed Claro M. Recto Avenue. In a corner lot was the site of the house of Deodato Arellano. On July 7, 1892, a secret council convened at this house following the arrest of Rizal to create a new organization, the Kataastaasang, Kagalang-galang na Katipunan ng mga Anak ng Bayan. Popularly known as the Katipunan, it was a secret society that promoted armed struggle, revolution, and separation from the Spanish Empire. A busy people’s market replaced the historic house. 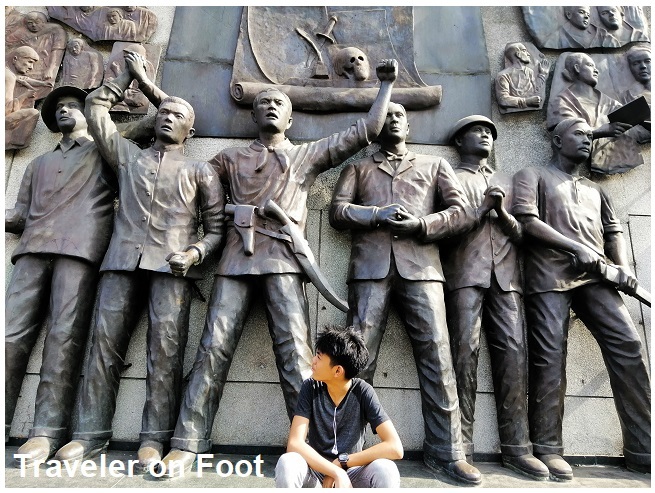 A monument composed of figurative sculptures of the Katipunan founders Deodato Arellano, Valentin Diaz, Andres Bonifacio, Teodoro Plata, and Ladislao Diwa surrounded by low reliefs depicting symbols, emblems and activities of the revolutionary society was installed by artist Ros Arcilla. EPILOGUE: HERITAGE CHAMPIONS. 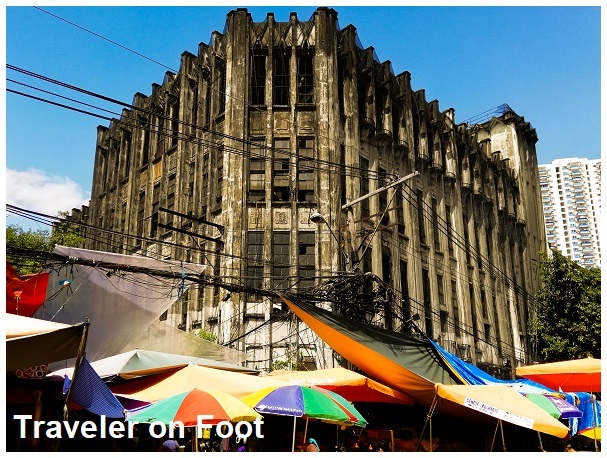 Looming like a crown to a forgotten carnival queen in the busyness of the fruit market in Divisoria was the Ides O’Racca Building. Built in 1935, was owned by the prominent physician of the Revolution, Dr. Isidoro de Santos. One of his patients was Apolinario Mabini. During the Japanese Occupation, the building became O’Racca Candy Factory. The government took over the property after the war. Got burned and abandoned since then. It was declared a cultural property by the National Museum in 2014 but no solid plans on what to do with this Art Deco jewel. In the wake of the old San Nicolas that we only read in books and digital media, Stephen’s enthusiasm for heritage structures remains infectious. 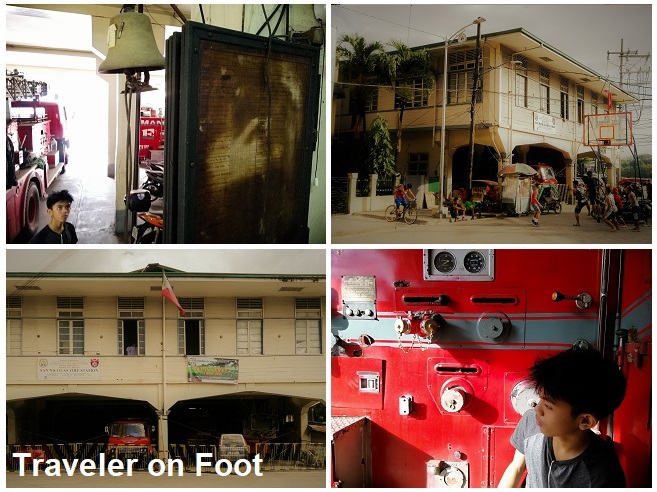 For his college thesis, he documented the remaining ancestral structures around his childhood neighborhood with plans to use it as a resource for heritage advocacy efforts. We need more champions, that like Stephen who takes ownership to campaign the preservation our ancestral heritage. NOSTALGIC FOR CHRISTMAS CARDS. Times are changing. There are more and more things to be nostalgic about. As a child, receiving and sending Christmas cards signaled the happiest season of the year. I remember my folks would start writing Christmas cards in lengthy notes and sending them to the post office as early as November so that our relatives in the US would receive them in time for the holidays. 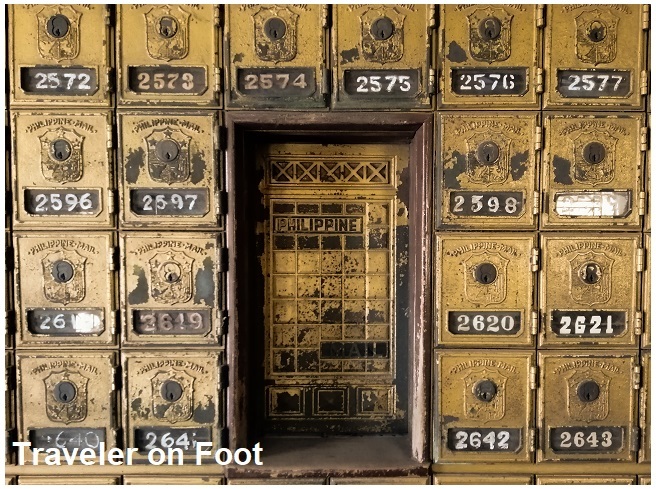 By December, I would regularly open the mail box attached to our gate (a feature we rarely see in contemporary houses today) to gather the sealed envelopes and peel off the stamps. Nowadays, we receive holiday greetings through instant text messages and emails most of the time, in a form of copied or templated greetings. We seldom write Christmas cards in all seriousness and send them via the post office. 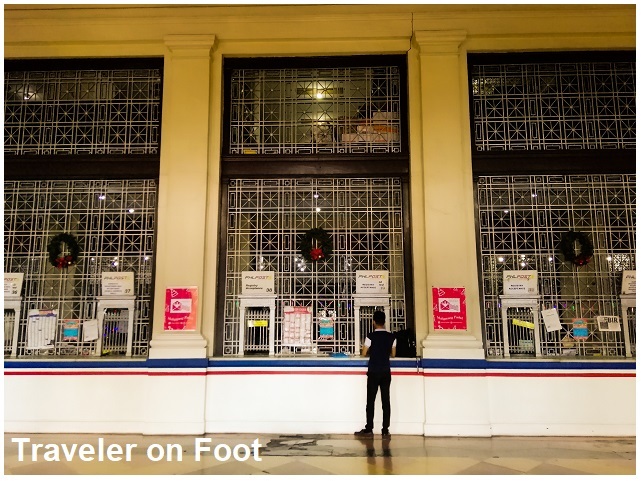 Longing for childhood Christmases, I went to the Manila Central Post Office a few days before Christmas to send some greeting cards to friends just like how my parents and grandparents did it in the past. POST OFFICE BY THE RIVER. 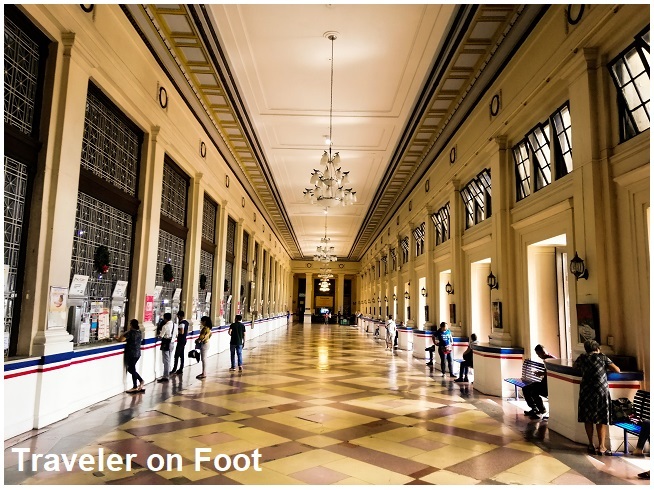 The Manila Central Post Office is located in what used to be a sprawling Plaza Arroceros that extended far to where the Metropolitan Theater and Manila City Hall now stands. 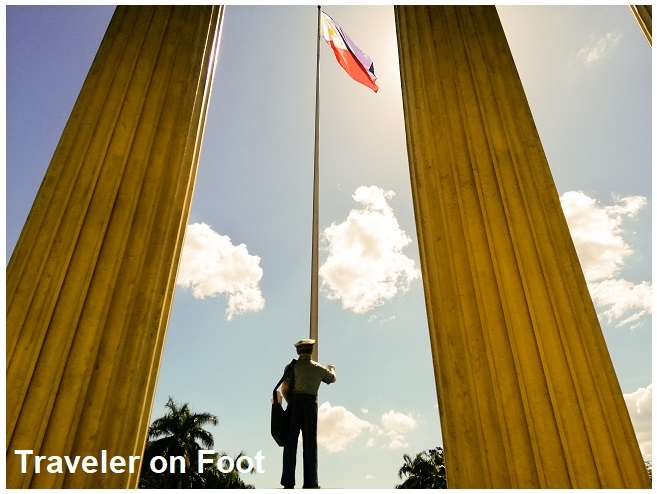 It was renamed Plaza Lawton during the Commonwealth Era and recently as Liwasang Bonifacio with a monument to the revolutionary leader, Andres Bonifacio as the centerpiece. At the rear of this impressive building, is the primordial Pasig River flanked by Jones and MacArthur Bridges. To build a post office by the ancient river was strategic during an era when goods and mail were transported via steam-powered vessels. Bathe in mid-morning sunlight, the monumental structure glimmered like a Roman temple to an important god. The entire length of the main building is elevated from the road by a flight of stairs that leads to a magnificent colonnade guarded by sixteen Ionic columns. THE BURNHAM PLAN. Past the arcade, people enter into the vastness of the main lobby through a march of doors and transact in the tall grilled windows. Clean, elegant lines, graceful and dignified this iconic building is a manifestation of the Burnham Plan. The Neoclassical style dominated the architecture of government buildings during the American years. 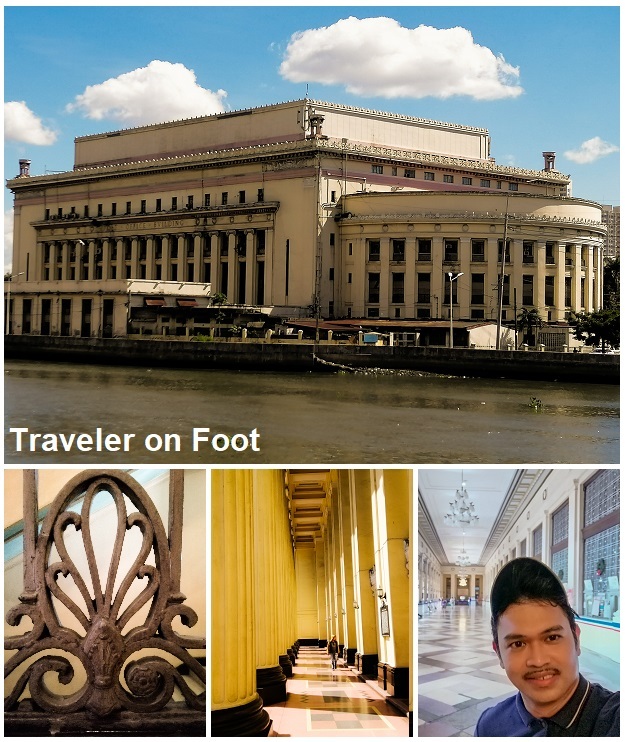 The Manila Central Post Office was merely a part of a greater design by Daniel Burnham. The famous urban planner was sent to the Philippines in the early 1900s to draw a plan for a modern state capitol. Burnham’s ambitious design for Manila was to mirror Washington D.C. with a Capitol Hill that would rise along Taft Avenue facing the bay (A tasteless Torre de Manila occupies this area today), a reflecting pool in the center with the Rizal Monument at the Luneta end. Just like the National Mall, government buildings would be arranged in a formal pattern around this quadrangle. 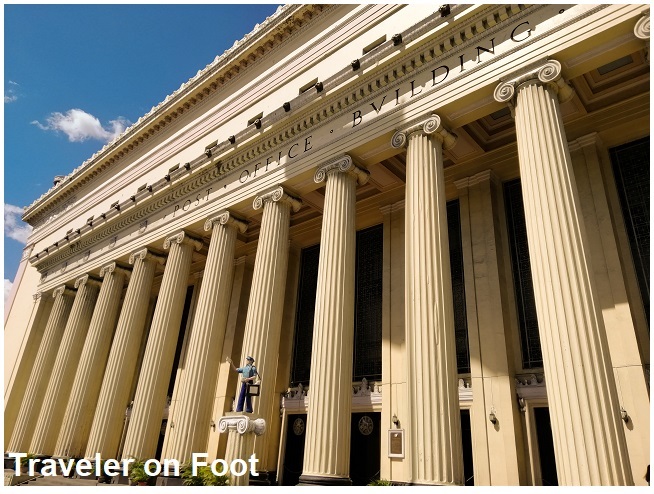 Of the proposed neoclassical structures for Manila, only the Legislative, Finance and Agriculture buildings that now house National Museum complex, and the Manila Central Post Office were completed. OBRA NI JUAN ARELLANO. The US-trained Filipino architect, Juan Arellano designed the Manila Central Post Office building. His works include the original Jones Bridge (with allegorical figures in Beaux Arts style that we can only see in old photos), the Legislative Building, the Metropolitan Theater and other iconic structures that represent the architectural face of the American Era around the country. Construction of the post office began in 1926 under the supervision of the engineering firm Pedro Siochi and Company. The post office sustained heavy damages during the Liberation in 1945 but it survived the hasty reconstruction a year after the war. The postwar building still bears the chastity of the original and stands as a memorial to Arellano’s magnum opus. AMERICAN TROPICAL. After depositing my mail, I started exploring the building for the first time. Though European in look and feel, the post office building is designed for the tropics. 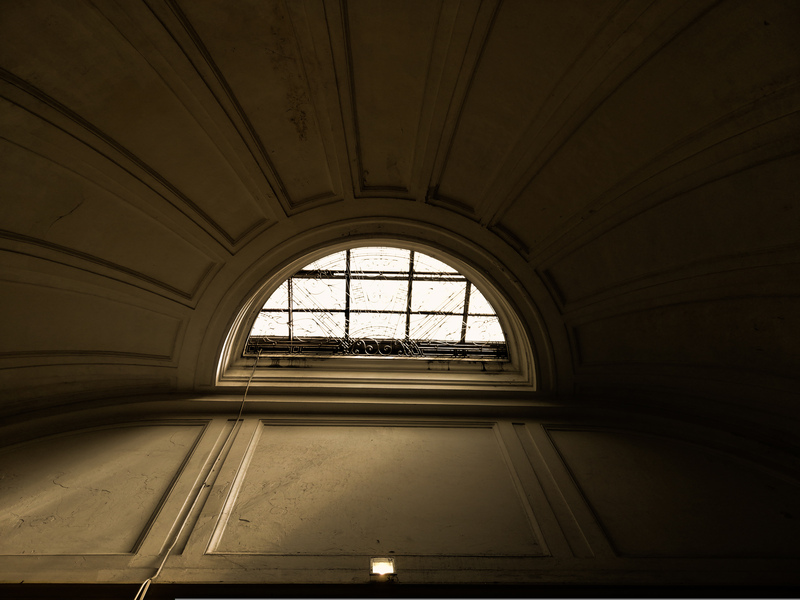 Generous light and air at main lobby streams through the grillwork and awning windows above the doors. 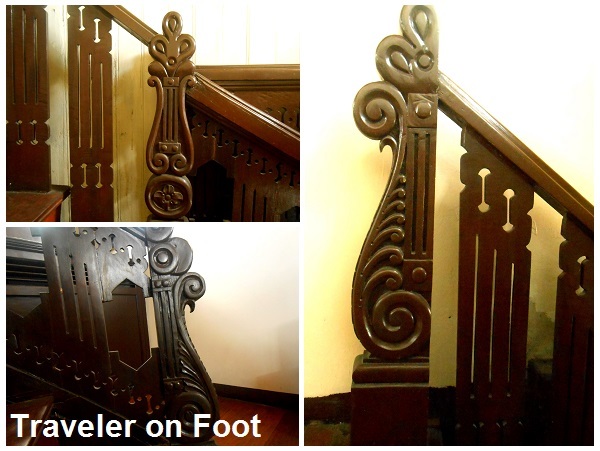 The ornate grillwork is repeated in the staircases that leads to the upper floors of the five-floor building. The two semi-circular drums on each end of the rectangular mast is topped with half domes. An atrium lends natural light to the parcel and registered mail sections. The highly decorated ceiling and wainscoting are attributed to the sculptor Isabelo Tampingco, whom Arellano often worked with. POSTAL AND PHILATELIC HISTORY. A postal museum is set in one corner of the main lobby. Displayed were equipment used by the post office in earlier times to weigh and postmark letters and packages. 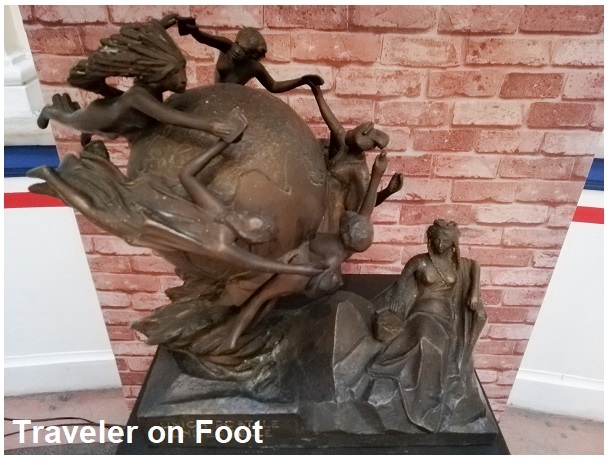 Also on exhibit is a maquette of the Universal Postal Union (UPU) Monument by French sculptor Charles René de Paul de Saint-Marceaux that shows five Beaux Arts figures floating around the globe representing the continents. The granite and marble monument was erected in 1909 at the UPU headquarters in Switzerland. The postal museum occasionally hosts a philatelic congress to display collectible stamps. 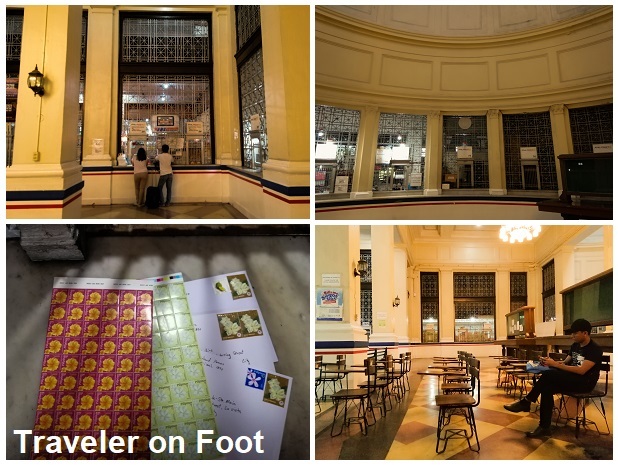 Special tours were conducted to retell the beginnings of the postal services in the country. 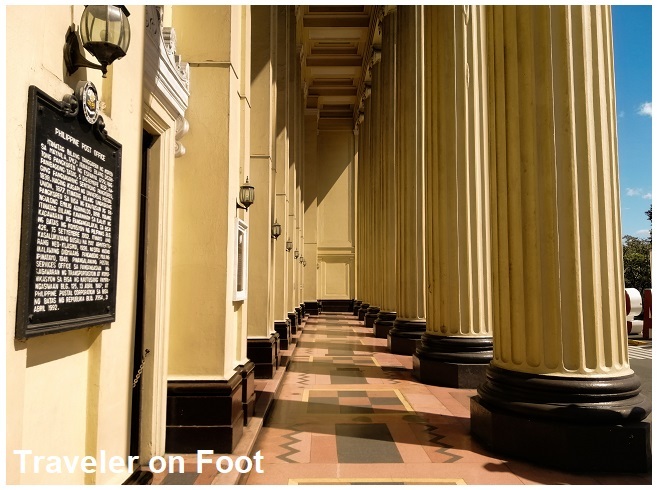 The first post office was established in Manila in 1779. 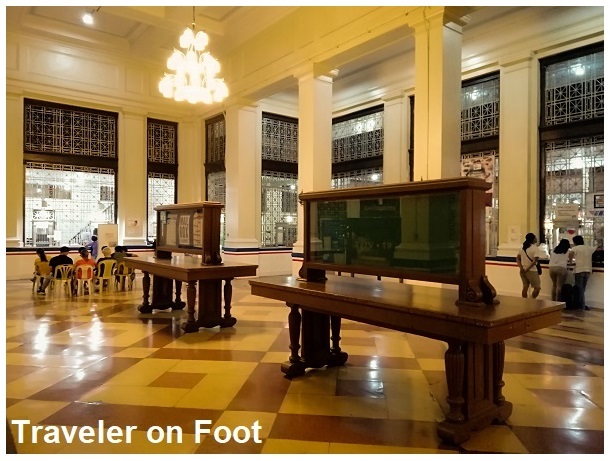 It was housed in the Aduana by the riverside of Intramuros. The first postage stamp was issued in 1854 bearing the profile of the reigning monarch of the time, Isabela II. The word Filipinas first appeared on stamps in 1872 with King Amadeo’s portrait. The last stamp issues by Spanish colonial government bears the image of the boy king, Alfonso XIII in 1898. During the Philippine Revolution, crudely printed stamps were issued with the word Filipinas and emblems of the Katipunan. In 1906, the US Insular Government issued its first stamps. Images of Jose Rizal and paintings of Fernando Amorsolo appeared in stamps during the American Era. During the Japanese Occupation, stamps were used for cultural propaganda with text that says Congratulations/Fall of Bataan and Corregidor 1942. Stamps in this period also bear a juxtaposition of the images of Mayon Volcano and Mount Fuji with text in Nipongo. LOCK BOX. At the side of the postal exhibit are stairs leading to the Lock Box area at the lower floor. 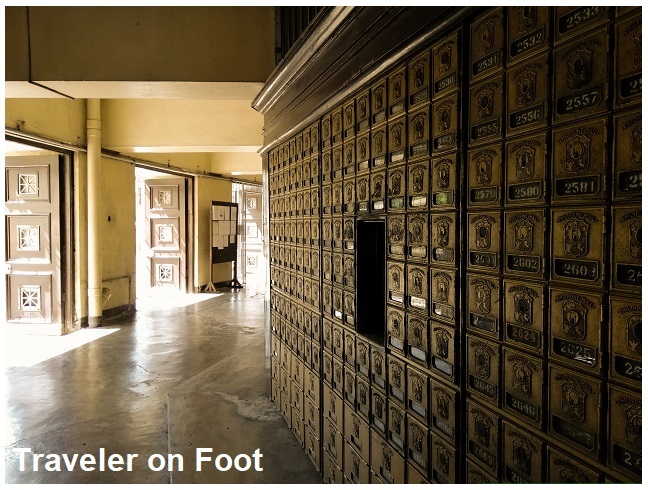 Post Office (PO) boxes were popular alternatives to mailing addresses. Lock boxes can be rented for a fee. Doors at the lock box section leads to the back doors that opens to a wharf by the Pasig River. Urban legends says that the lock box section were used for tortures and as a prison during the Japanese Occupation. EPILOGUE: MONUMENT TO SELF-GOVERNMENT. A fitting finale to that mid-morning trip to the Manila Central Post Office is to view the heroic statue of the mamang kartero facing the flag framed by the Arellano’s columns in homage to the couriers that delivered greeting cards that gave me happy memories of childhood Christmases. In the fast internet age, it maybe a hard sell to keep the tradition of sending mail through the post office. However, Arellano’s neoclassical magnum opus must be preserved as a monument, a tasteful reminder to generations of that time when Filipinos were being readied for self-governance and democracy. OCTOBER FIESTA IN ANGELES. There are three important fiestas in Angeles, Pampanga during October: The Fiestang Naval (Feast of Our Lady of the Holy Rosary of La Naval) held every second Sunday of the month, The Fiesta de San Angelo (Feast of the Guardian Angel) on the following Monday after the Fiestang Naval and the Fiesta nang Apu Mamacalulu (Feast of Christ in the Holy Sepulchre) held every last Friday of October. 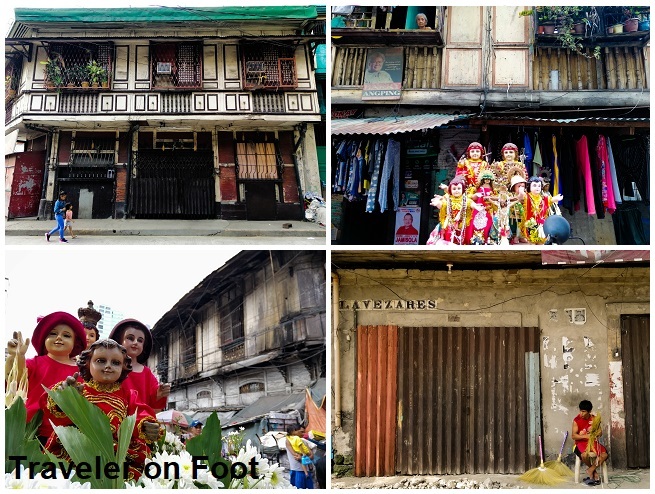 All three fiestas are traced back on the days in the 18th century when the primeval barrio of Culiat were being cleared from the wild by Don Angel Pantaleon de Miranda and wife, Doña Rosalia de Jesus to make way to a new settlement known today as Angeles. It was said that during clearing activities were made in the wilderness, the image of the Our Lady of the Holy Rosary was carried by the founders to bless the new town. A couple of centuries later from its clearing, Angeles has roads, bridges, barrios, farms, and a town center with buildings like a municipio, a magnificent church to enshrine the image of its patroness, and grand houses of the town elite. Some of these structures still stand to this day. One of which is the Pamintuan Mansion. PAMINTUAN MANSION. 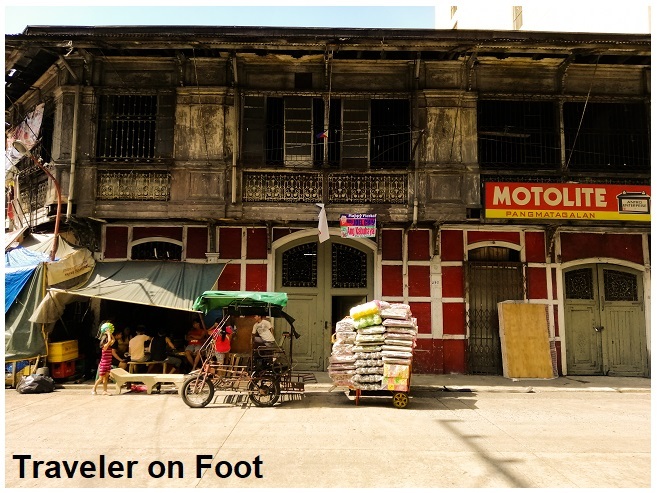 The Pamintuan Mansion stood at intersecting roads in the poblacion, just a few walks from the Sto. Rosario Church. 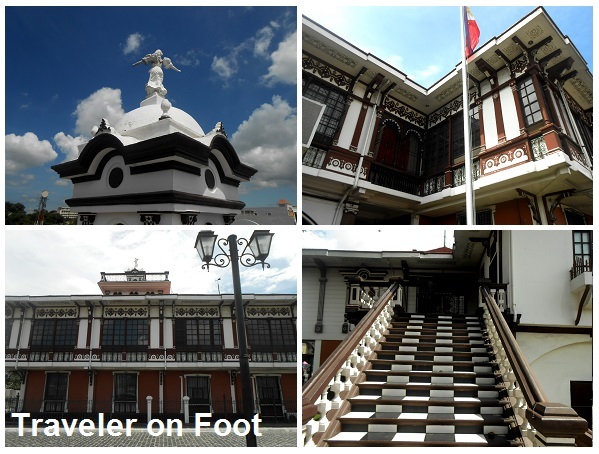 The massive house was built in the 1880s by the landlord Don Florentino Pamintuan and wife Doña Mancia Sandico. It appeared stately with heavily-carved and decorated exterior and a tasteful Victorian architecture. A historical marker describes the house that served in different occasions as residence to General Emilio Aguinaldo, the headquarters to General Arthur McArthur, a barracks to a regiment of Japanese soldiers, an American clubhouse, a hotel, and a satellite office of the Central Bank of the Philippines until recently when the antique mansion was fittingly refurbished to become the Museum of Social History. MUSEUM OF SOCIAL HISTORY. One enters the Pamintuan Mansion through the entresuelo, a mezzanine with rooms that serve as office of the museum curator and e-learning hub. This section of the house is raised from the ground floor or zaguan some steps higher. The zaguan traditionally severed as parking space for the carruajes (carriages) and carozzas used for processions. It is paved with a dizzying pattern of machuca tiles. Machuca originated from the Baldoza cement tile factory in the 1900s owned by Don Jose Machuca de Romeo from San Miguel District of Manila. A room at the zaguan housed an impressive assemblage of indigenous fabrics, weaving tools, fashion accessories and clothing styles from the earliest form to its fusion into contemporary trends chiefly from the collection of the famous doyenne of Philippine fashion, Patis Pamintuan-Tesoro. TIME SLIP. From a tour of the zaguan, a walk to the flight of steps brought me back to the entresuelo that led to the wide narra staircase. I imagined the history that passed on the steps. On 12 June 1899, only a few days since the assassination of General Antonio Luna in Cabanatuan and two years have after the execution of Andres Bonifacio in Maragondon, General Aguinaldo celebrated the anniversary of Philippine independence which was declared from his house in Kawit. From one of the windows of Pamintuan Mansion, General Aguinaldo with his immediate family, his young aide-de-camp, Manuel Quezon and close comrade General Tomas Mascardo watched a military parade under the command of his favorite general, Gregorio del Pilar. Present in the occasion were Jose and Joaquin Luna who were probably inquiring about the death of their brother. FIESTANG NAVAL. Upon reaching the second floor, the house was well lit just like in the olden days for an evening of tertulia. Under the metal ceiling with repousse floral designs and framed by the calado transoms, neoclassical arches and columns, a Marian exhibit was being staged in honor of the town’s patroness, Nuestra Señora del Santissimo Rosario de La Naval. How Manila’s La Naval made it to Pampanga can be traced from the efforts of the town’s founding fathers who petitioned the separation of the old Culiat from San Fernando and to formally adopt the name Pueblos de los Angeles in honor of the trailblazer Don Angel de Miranda. 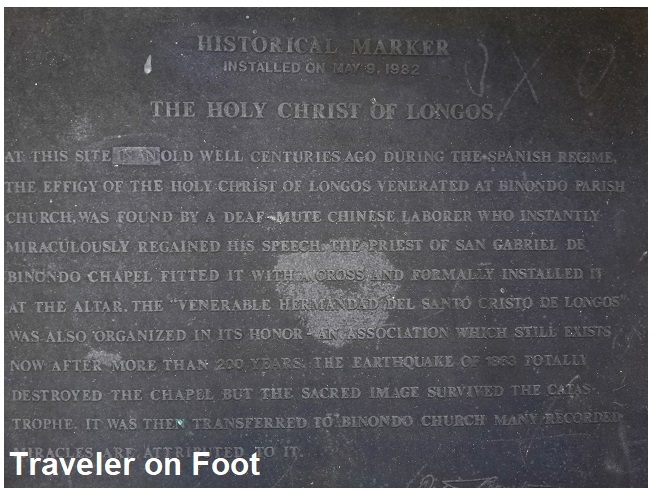 The main parish of Angeles was named Parroquia ning Santo Rosario to give honor to the Our Lady of the Holy Rosary who the settlers believed have interceded to achieve their township. In October 10, 1830, the first La Naval fiesta was celebrated in Angeles with an unveiling of the image of the Virgen La Naval followed by a solemn procession. PAMINTUAN UNDER STARS AND STRIPES. When Aguinaldo and his troops left Angeles, General Arthur McArthur commandeered the mansion for his headquarters until the end of the Revolutionary Government in 1901. During the American Period, the Pamintuan House hosted banquets that received important political figures like High Commissioner Frank Murphy in the 1930s. Being an important venue for hosting social events, the mansion was furnished with the latest furniture from the intricately carved beds to Art Nouveau and Art Deco chais and tables. THE HAUNTED ANGELES HOTEL. Peace time in Angeles was shattered by war. The Japanese bombed Fort Stotsenburg. A group of the Japanese soldiers occupied the historic mansion. During Liberation, the house became a clubhouse and recreation facility for American servicemen. Perhaps due to the residual energy left by previous occupants, the Pamintuans decided to lease the mansion to a Chinese businessman. In 1947, the mansion was converted into Angeles Hotel. In the book, Letras y Figuras, former Central Bank Governor Jaime Laya mentioned a ghost of a young lady in night gown who appeared floating in the tower room. 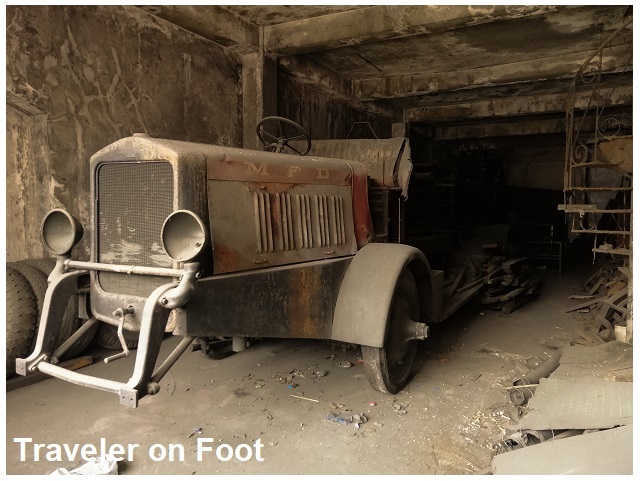 We can only guess at the probability that this restless spirit might have been a victim of war atrocity since the Japanese Occupation left us with several haunted places around the country. 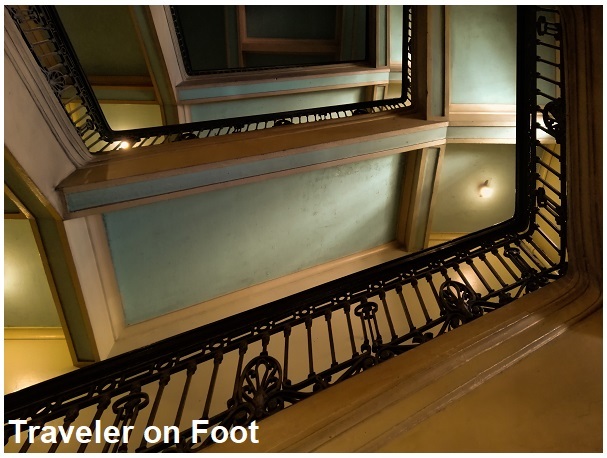 A spiral staircase at the second floor leads to the tower room and another one with Art Nouveau carvings leads to a rooftop veranda. EPILOGUE: BEST VIEW. From the rooftop veranda of the Pamintuan Mansion is a 360 degree view of the townscape of Angeles. A statuette of a lady in early baro’t saya that serves as a decorative finial to the mirador or tower room must have had the best vantage point to watch generations of Fiestang Naval processions.